A couple of months ago, I decided to join my husband on his trip to New York, NY, for a fantasy sports industry event he was attending. New York is my favorite city in the world, but I hadn’t been back there in over 20 years. Since the trip fell on the weekend before our 9th wedding anniversary, it seemed like the perfect time and place to celebrate a little early. We joked that it was going to be an amazing trip because we would only see each other on the day we arrived and the day we would depart for home, due to his event schedule. I planned out the places I wanted to see and things I wanted to do. I asked friends for tips on their favorite places. I reveled in the joy of having only myself to be concerned about for two days! I was ecstatic and couldn’t wait to go. A little under a week before we were set to leave, after some persistent suspicions, I took a pregnancy test and was gloriously surprised with a positive result. We were relieved and overjoyed. This journey to have another baby has expended so much from us, a positive test relieves a bit of the weight we carry. We were also anxious and scared, as only a parent who understands that a positive pregnancy test means you’re pregnant, but not necessarily that you’re going to have a baby, can be. We only had a possibility of a baby at that point. So, we looked ahead to future plans to see how this pregnancy would fit, but also understood that it was much too early to really have any idea of what to expect. We decided to wait to tell the doctor, as well as modified plans for our trip. I started to have some very light, brownish spotting a few days later, which has happened in previous pregnancies. As much as I tried to tell myself that everything could still be fine, my anxiety spoke louder. About 4-5 days after our first positive pregnancy test, I took another. The positive sign was still there, but it was a little fainter than the one previous. I waited a day before doing it again, and this time the result was negative. I told myself that it might be because I had gone to the bathroom during the middle of the night. It was early. There wasn’t enough hormones built up yet. We still had our possibility. We flew out on a Thursday evening, after traveling for 3 hours to drop off our daughter with her grandmother before heading to San Francisco. Upon arrival in our terminal, I went into the restroom and saw the first drop of bright red blood. My heart swooped into my stomach and my breath left me in a rush. I had mentally prepared both myself and Justin for this probability, given the signs, but I had still held on to the hope that I could hold on to this baby. I still thought that after all we had been through, with the loss of Lincoln last May and the early loss of our baby sixth months later, the universe couldn’t possibly put us through our third loss in less than a year. Our fifth loss in less than 3 years. It didn’t seem fair. As we flew from the west coast to the east, the bleeding and cramping increased. Once we arrived at our hotel, over 11 hours after having left home, I was physically and emotionally drained, and felt hopeless and discouraged. We revised our plans for the day, and both laid down for some much needed rest. Once we awoke, we decided to push forward with our anniversary dinner together, followed by a meet up with the rest of the fantasy experts, at a local bar. We wanted to put the miscarriage momentarily to the side, and enjoy some of our brief time together on this trip. The dinner was amazing and the evening with new friends was a wonderful distraction from familiar pain and disappointment. We ended the evening holding each other in bed. The next day, I begged off from our planned breakfast and let Justin meet up with his friend by himself, since I had spent most of the previous evening in pain and discomfort. As the morning wore on, it only increased, along with my anxiety. I canceled plans with a friend, to watch the St. Patrick’s Day Parade, and attempted to sleep and avoid. Unfortunately, I continuously awoke with pain, sorrow, shame and guilt. I felt ashamed for wasting my short time in New York, while simultaneously feeling guilty for wanting to do anything other than mourn the loss of the life inside of me. Around late-morning, the bulk of the miscarriage had passed, and the pain began to ease. I decided to get up, get ready, and attempt to make the most of the time I had remaining in the day. I decided to mix together the plans I had looked forward to most, along with recommendations from a friend I had messaged earlier in the day (one of the few people to know about what I was going through, who offered his love, condolences and advice, along with some agenda choices for my now marred trip). Yet, as I got ready, I was still conflicted with the feelings of shame and guilt that plagued me all morning. I struggled to reconcile my feelings of sadness and loss, with the desire to not miss out on the opportunity to take advantage of my time in one of my favorite places. How could I want to do anything more than lie in bed and cry over yet another baby that would never be held in my arms? How could I, after having waited for over 20 years, waste the chance (not to mention money) to walk around the streets of New York? Would it be avoiding my feelings to allow myself to enjoy the city? Would it be ridiculous of me to spend my brief trip holed up in a hotel room by myself, wallowing in pity? I was stuck in a cycle of self-recriminations regarding what I should do and what I should feel, and how to best be true to my feelings. As I continued to reproach myself, my thoughts drifted to pondering how our society has changed in many ways, over several decades, in regards to how emotional/mental health is viewed and handled. There was a time that many would approach it by avoiding or ignoring emotions. Simply shove them down as far as they would go, and then keep moving forward. Eventually, the pendulum swung the other way, and embracing and voicing feelings has been seen has the healthy approach. My battle with myself was due to being pulled between the two. I realized I was putting too much stock in what I thought I should do, rather than what I felt I wanted and needed. I wasn’t being true to myself, nor to my feelings, because I was allowing outside pressure to dictate my actions. Then I began to think of others in my life who had suffered loss, the ways they handled those losses, and my judgement of their actions. I have a friend who lost his wife, after a long battle with cancer. Not long after her death, he made the decision to close her Facebook account and get rid of her belongings. I remember thinking, “No! You’re moving too quickly! You’re not giving the kids time to process this loss before changing things. You’re going to regret this!” Recently, a friend unexpectedly lost her father. A week later, she shared her feelings of wanted to get back to normal and not wanting the negative aspects of dealing with grief. Again, I judged, thinking, “Grieving is normal and healthy. You need this to move forward without the pain crippling you later!” In thinking about these friends, I realized how wrong I had been. I don’t know what they need in order to feel and process their grief. As much as I didn’t want others to rush my own grieving process, I couldn’t push my own timeline on others. These friends could only do what was best for them, and be true to their own feelings. I had to realize that I couldn’t push, even silently and from afar, what I perceived to be best way to handle their loss. They could only find their own way through it, and I could only support them, even silently and from afar, in that journey. I also realized that’s what I needed to do for myself. I left my hotel room and I walked. I walked from the Financial District to Central Park. Then I walked some more. I marveled in the sights and sounds of the city. I listened to conversations and I people watched. I visited places I loved and found areas I had never seen before. I walked, but not away from my feelings. I found joy, even in the midst of sorrow. I found that holding onto my happiness didn’t mean that I had to let go of the hurt; I could be with both and still stay in the moment. Most of all, I found that doing what I wanted and needed, for myself, was the right thing to do, and nothing could be truer for me. I was referred to Amie Lands by my friend, Nicole, in 2015, following the death of our son, Josiah, at 21w3d. Amie is a Certified Grief Recovery Specialist®, and she had a new group session starting that I thought would help me to process my grief. It did, but it also gave me so much more through my growing friendship with Amie. Her strength and kindness have moved and lifted me in ways I could not have imagined. In addition to her work with The Grief Recovery Method, Amie is also a mom, teacher, author and founder of The Ruthie Lou Foundation, which was named after Amie’s daughter, Ruthie Lou, who she held for 33 days. Amie’s first book, Navigating the Unknown: An Immediate Guide When Experiencing the Loss of Your Baby, is an incredible book for any parent finding themselves in the bewildering position of grieving a pregnancy or child loss. This is the book I wish we’d had following Josiah’s death, because “This book encompasses everything that you need to know about navigating the unfamiliar journey of grief. It covers all the unexpected decisions that need to be made when a parent faces such devastating news, and follows through the first year and after, including: informing others, experiencing grief, taking care of oneself, asking for help, how to re-enter into the world, having ‘grocery store conversations’, holidays, birthdays, anniversaries, and how to memorialize, honor and celebrate your precious baby.” Additionally, Tending to Your Heart is a free, downloadable e-book created by Amie to help others start their healing journey. In March 2017, Amie sent me a message to ask if I would like to be a part of her newest project, a book for health professionals and birth workers that would give them insights as to how best assist the families that would go home without their precious child(ren). At that time, I was four and a half months pregnant with our second son, Lincoln. While our hospital experience (not just the loss, but how we were treated) when we lost Josiah was traumatic, and I wanted to share our story in order to help others, I was nervous about how reliving that time in the hospital would affect my current, anxious state and our baby. Despite my reservations, I agreed to write our story, in hopes that other families would not have to suffer in the same way. Less than two weeks after agreeing to participate in Amie’s new project, I once again went into premature labor and delivered our son, Lincoln, at 19w4d. He lived for nearly 3 hours, gently held by those who loved him, before passing in his father’s hands. The compounding grief was shattering, and I told Amie there was no way I could contribute to her book now. Of course, she understood. Yet, as the days and weeks passed, I contemplated how different the two experiences were, thanks to the medical staff who shared Lincoln’s brief life with us. I didn’t have the weighted guilt and regret that anchored me after Josiah’s death, and I attribute that to the care and respect we were given during our hospital stay. More and more, I saw that I had something to share that had the potential to make a positive impact for other families. Despite numerous attempts to write something clear and concise and helpful, I found that most of my drafts lacked the truth I was searching for. They instead were filled with hurt and anger and deep sadness. While those emotions were perfectly understandable, they didn’t allow the heart of what I wanted to share to shine through. When I took a step back, I realized it was because I was not allowing myself to drop into those moments in the hospital and really feel how those experiences had imprinted themselves onto me. I took a deep breath and willed myself to sink into those memories, and by doing so, “When Lightening Strikes Twice,” flowed through me. It is true and honest and real. It is part of the story of my boys, Josiah and Lincoln, and I’m grateful for the opportunity to share it with others. “Our Only Time was created to motivate, inspire and show appreciation for medical professionals through experiences told from a patient’s perspective. Through heartfelt stories, families share the sacred time spent with their baby — whether in utero or after birth — and offer insights into how medical professionals positively impacted their experience. Also included are recommendations on how best to be supportive of patients and what types of actions to avoid during this devastating experience. I’m proud of the incredible work that Amie has done, and I’m proud to be a part of it. I know this book will make an tremendous impact on families living through an unimaginable loss, and the professionals who are assisting them. If you or someone you know might benefit from reading this book, please do not hesitate to order it today. My memory of many of the moments while in the hospital is vague; too little sleep and too much adrenaline, heartbreak and fear. They blend the memories together like a painting by Monet, giving only vague impressions. But I remember the words that our nurse, Anna, said to me as she sat in the chair beside my bed and took my hand. Her words struck me most because they were in such stark contrast to how things were handled two years ago, when we found ourselves in quite literally the same position. At that time, things happened so quickly it was hard to understand. To come to grips. To accept. To breathe. I was 21w3d pregnant with our son, Josiah. We were so excited to be having a boy after 3 ½ years of trying to get pregnant, following the harrowing birth of our daughter 6 years prior, a birth I nearly didn’t survive due to severe hemorrhaging and a cervical tear. We were so concerned with my own survival through another birth that we never thought about the possibility of something happening to our son after we crossed that first trimester threshold. Then my water broke in the middle of the night. We rushed to the hospital and were taken immediately to Labor & Delivery, or L&D. I was examined and, once the situation was explained to us, we were given options. I could stay in the hospital on bed rest, hoping to hold onto Josiah until he had a better chance of surviving, or we could give birth to him and have an opportunity to say goodbye, or we could terminate the pregnancy. Those choices dwindled in less than an hour when I began to heavily bleed. After the trauma of my first birth, the doctor became concerned about hemorrhaging. We were told that the best way to ensure the chance of my own survival, since there was no hope of saving our son, was to terminate the pregnancy immediately. There wasn’t time to ask questions, or consult our regular doctor. We were terrified and devastated, and made the decision we thought would be best for our family, although we didn’t fully understand the choice we were making. The doctors and nurses and staff grieved with us. They were caring and kind, and took wonderful care of me as I was prepped for surgery. However, the prep was only for surgery, and not for the shattered pieces of me that would remain. Looking back, I could see that the care was only for me, and not my son. He was not viewed as a patient, as a person. The only tangible evidence I had that he existed were the ultrasound photos and the prints of his hands and feet that a nurse was thoughtful enough to make sure we had before we left. That wrecked me, because I needed to grieve a person that wasn’t even truly recognized by those that were helping me. A little over six hours after we had arrived at the hospital, we were discharged home and I left empty and ill-equipped to handle the way that my life had been cleaved apart. They say that lightning doesn’t strike twice, but in tragedy this isn’t true. This is how we found ourselves back in L&D, two years later, facing the loss of another son. I was 19w4d on the day Lincoln died. While so many things were different, it was all very much the same. We would still be leaving the hospital without our son. This time, it was my cervix that gave out, instead of the amniotic sac. I had arrived at the hospital the previous day, and we tried all night to save him. By the next morning, it was obvious that there was nothing else that could be done and I was going to have to give birth that day. “What’s going to happen now?” I asked Anna, as she turned in her seat to face me and clasped my hand between hers. “Whatever you need,” she replied. We never met with anyone other than nurses and doctors when Josiah died, but this time we were able to speak with a professional who guided other families through moments like these. Sitting in our dark room, we discussed resources and support. We reviewed mortuaries and end-of-life tasks that are often forgotten. We talked about counseling and bereavement groups. We were given these tools in order to reach out to our community and find what we needed to survive well. We were also given a folder with the same information, since we certainly wouldn’t remember later. But she knew we would need it eventually. We did. “Would you like to meet with a minister or priest?” Anna asked. We lost Josiah without any spiritual guidance, but Lincoln was blessed before he was born, which was of comfort to me because it was another acknowledgement of my son’s spirit, which I had come to cherish and love during my pregnancy. The minister came to our room and also sat beside me to talk more about our sons and our losses. We shared with him the circumstances of how we lost Josiah, and the wracking guilt choosing to terminate a fiercely wanted pregnancy left us with. We also discussed our too-soon-to-be loss of Lincoln, and our fears for what would come after. Fears of having to tell our daughter, and other family and friends, that we had once again lost a son, as well as fears of navigating the compounded grief we were facing. He listened and his commiserated. He offered guidance, thoughts and a bit of faith for what was to come; faith that we needed, but had been missing for some time. “Would you like something for the pain? I know you’re hurting right now, but there’s no need for you to suffer physically,” Anna assured me. Once the epidural was in place, I told her we were ready to meet Lincoln. We didn’t want to prolong the inevitable, and wanted to allow him to go peacefully as we held him. “How is this going to go?” I asked. She could have glossed over what we were about to experience. She could have used terms we didn’t understand. Instead, she was blunt and she was thorough. And she prepared us as best she could, both physically and emotionally for what was about to occur. She honored him. Not only did Anna honor us, our family, our experience, our past, our birth… she honored our son. She saw him, and she saw us. She saw our love, and she made sure to mirror that back to us. She knew that we were going to leave the hospital in pieces and knew we would have to be put back together. Through every step of the way, as slowly as we needed to go, she made sure that some of those pieces would be imprinted with Lincoln, to carry with us always. She gave us memories of love, thoughts of future healing, and a small piece of her to carry with us as well. She taught us that when lightning strikes twice, it’s time and care that can make all the difference. This past Friday was the 2nd anniversary of our son Josiah’s estimated due date. Last year, on the 1st anniversary, I wrote about why I choose to celebrate my son on this day. Although he never had a chance to be born, I need to have a day that is marked just for him. Last year, my family and I spent the evening at the beach, in quiet remembrance of our loss and our pain and the enduring love we are surrounded by. This year, we simply spent time together at home. As more time passes, the pain of this day thankfully softens. I’m able to think of the love of those around us, and how they too remember and honor our son. When his estimated due date came around four short months after we had to make the choice to terminate our pregnancy, family and friends joined us for a memorial at our home. Those that were unable to make it sent us pictures, via Facebook and text, of candles that were lit at the same time as our memorial ceremony, and messages with our sweet boy’s name. Thanks to On This Day on Facebook, I’m able to see those messages each year and remember how our loved ones stood beside us at our darkest time and ensured that our son and our love for him will not be forgotten. I can’t help but imagine what our lives would be like if I had been able to carry our son to term. What his 2 year old face would look like. Would he be fair like his father and sister, or would this child have a little more of me visible in his face and coloring? I wonder what his 2 year old personality would be like. Would he adore his older sister as much as I know she would adore him? I often stare at other children who are at the age he should have been and daydream of what could have been. At the same time, I’m taking the experience of the past 2 years and using it to carry me through the fresh pain of losing our son, Lincoln, earlier this year. When we lost Josiah, the hurt was unimaginable and acute. There were times that I felt like I couldn’t breathe as it pressed in on my from all sides and suffocated any sense of the world around me. I couldn’t envision a world where I survived that loss. I couldn’t grasp being able to have any sense of normalcy again. I couldn’t understand how I could possibly live without him. But I did. I survived, I settled into a new normal, and I continued to live. As time moved forward, so did I. It has been one of the most difficult things I’ve ever accomplished, but I’m grateful to have been able to attain the foothold I now have. The thing about having been to Hell and back is that the next time you’re there, you know the path that will lead you out. It seemed unbelievable to have lost Lincoln back in April, after having already experienced that nightmare. It seems so unfair that we would be forced to face that reality again. Yet, even in the fog of my grief, I was able to hold on to the knowledge that I would get through agony of this heartbreak and piece myself back together. As if I had left bread crumbs to follow in a dark forest, I knew the steps I would need to take to be ok. And I knew that when I was lost, it was only a temporary setback to getting myself where I needed to be. There is not a single thing that makes any experience of loss easier. It’s all hard and wearing… even maddening at times. However, time made it better for me. Experience made it more bearable for me. It has only been a little over 5 months since Lincoln died, but I know the smell and taste and feel of this sorrow. I know where I am, and where I am going. I know that there will come a time that I feel the pain, but more strongly remember the love. I will celebrate that love. Love that we are blessed to have within and around us, and love we carry in our hearts instead of our arms. I will celebrate that, as well as Josiah and Lincoln, time and time again. Although I don’t remember who, after the loss of my son, Josiah, someone sent me a story that touched me in a way I couldn’t fathom at the time. Theirs was one of many hands that reached through the fog of pain and grief to give me an buoy. The story talked about grief as waves. Waves that, in the beginning for me, crashed over me in unrelenting time. I was drowning in them, and just trying to hold on. Eventually, the waves became smaller and I got a longer reprieve between them. After that, I could see them coming at me. I had time to prepare, to hold my breath, to grab a lifeline and not get swept away. At least, that’s what I hoped. I’ve got a big wave coming at me right now. I knew it was coming; I could see it in the distance. Yet, even knowing it is going to unavoidably wash over me, I don’t know exactly what to expect. I don’t know how large it will be, or if it will be a single wave or a whole storm of them. I don’t know how long I will need to hold on for. I don’t know how to go back to barely being able to move or breath, but I know I can’t escape it. You see, this Friday, August 25th is the estimated due date for my son, Lincoln. The date to me is significant, and yet complicated. It’s an unanniversary. A day that will never be what it should have been. We are certain that Lincoln would not have been born on this day, and that I most likely would have been induced a week or two before. But with those unknowns and uncertainties, this is the only true date I can hold onto. For me, it marks a finality in this chapter of our loss, and the beginning of our life beyond it. There are other waves to come, but this is the final “should have been” for me and for us. For the last few months, there have been lots of, “I should have been 32 weeks now,” and “You should have been able to feel him kicking now.” There are an infinite number of them that will all end on Friday, leaving me in a not unfamiliar space of life without, and dreams unrealized. A wide open space filled with dead ends of an alternate life I’ll never have. As the wave gets closer, I begin to panic a little, wondering how far it will knock me and for how long. Even when I’ve already felt the same pain previously, I just don’t know how bad it will be when it comes around again. The anticipation is its own set of waves right now, unsettling and distracting me. Taking my breath and my courage. Thinning my patience and my resolve to be strong. I find myself thrashing already, lashing out at those around me or isolating myself and becoming very quiet as I resign to be drowned all over again. When we lost Josiah in 2015, I had a plan. A spot in the horizon to focus on as the wave crashed down. I called it his unbirthday, since he never had the chance to be born. I planned to have his name tattooed on my pelvis, in the area that I felt him move most often. We also planned a memorial, with close friends and family, to honor his brief time with us. We asked friends and family around the world to light a candle with us and say his name. However, Lincoln has a birthday. He was born on April 4, 2017 at 2:39 pm and he lived for 3 hours. It doesn’t seem right to memorialize him on his estimated due date when we have a truly significant date already. I’m left not knowing what to do, which gets layered onto not knowing what to expect this week and not knowing how I’m going to feel. There’s so much uncertainty, and even more regret. Should I have planned another memorial? Should I have arranged to get another tattoo? Am I mourning the loss of Lincoln less than I did Josiah by not doing these things? Am I marring his memory and belittling his importance in my life? I keep adding to the list of unknowns. I’m trying to remember that this is a time to be kind to myself. A time to keep my expectations low and only do that which I can comfortably face. I’m trying to remember that my love for my son is marked by the beating in my heart, the tears in my eyes and the sorrow in my bones, rather than acts that will bring me no true peace. I’m trying to accept what is, and not get weighed down by what should have been. So this wave will come for me, like a predator claiming it’s prey. I will stay home that day, to allow the wave to consume me and steal my breath with unimaginable pain all over again, without the struggle of trying to hide it from others. I will be tossed and unmoored by its power and strength. I will cry and I will grieve. Then, as the wave recedes, I will anchor myself once again. Anchor myself to my loved ones and to this new me I’ve been forced to become. I will tread these unknown yet recognizable waters, continuing to swim and wait for the next wave to arrive. That wave will come, and the next, and the one after that. There will be other unanniversaries, unbirthdays, actual birthdays and small, unexpected moments that will crash over me. There will always be these waves, but at least I now know that for every time they knock me down, they will not take me under. I just have to hang on. I’ve thought about writing this piece all week, but the announcement of Linkin Park lead singer Chester Bennington’s death by suicide (https://afsp.org/statement-american-foundation-suicide-prevention-chester-bennington/) has brought me a certain sense of urgency. While I enjoyed some of Linkin Park’s music, I wasn’t a faithful follower, so his death doesn’t impact me as a fan. Instead, it saddens me as someone who lives with depression and experiences suicidal ideation. I discussed this with a co-worker today, and we talked about the connection between Bennington and Chris Cornell, who also died by suicide earlier this year. Whether by chance or determination, Bennington took his own life on what would have been the 53rd birthday of a very good friend of his. My co-worker didn’t understand why the pain from Cornell’s death would push Bennington to his own suicide. I explained that it’s not always the sadness over that kind of loss, but the hopelessness of feeling that if the other person couldn’t beat back this particular demon, how can anyone else? In 2013, a guy I went to high school with died. I had always admired Jon Glass, and my heart broke for his wife, Amie (another friend from my school years), and their daughter. I was devastated when I learned that he had died by suicide, and shocked to find that Jon had struggled with depression for years. We were not close friends (we knew each other in high school, but did not hang out much, and we only kept in touch through Facebook), but his death impacted me because I couldn’t help but think, “There but for the grace of God, go I.” I have the same reaction every time I hear of a friend or family member or friend of a friend or celebrity who has died by suicide: why them and not me? Almost a year previous, in 2012, I was inspired by the death of Junior Seau (also by suicide) to write about my thoughts and experiences with depression and post them on Facebook. However, after Jon’s death, I felt a desperation to talk more about depression and suicide. To understand more about these insidious issues that plague so many of us. Those of us who do so quietly and think that we are alone. I wanted to let others know that they are not alone, and I wanted to know that I was not either. Yet, even with the honesty and openness that I tried to foster, I still could never discover the key difference between myself and those who ultimately lost their battles with depression. This frightened me because if I couldn’t figure that out, how could I avoid this being my fate? How could I help stop it being the fate of others? During a phone conversation with Jon’s widow, Amie, she asked if I had a plan. I thought she was asking if I had a plan of how I would commit suicide, but instead she wanted to know if I had a crisis plan to prevent it. This was very enlightening to me, and I began to do research on how to develop a suicide prevention plan. That’s a scary thought to have. It’s not one that I want to have, and yet it’s exactly what popped into my head as I drove to my therapy appointment a week before my family left. Now, I’ve learned enough about myself and my depression to know that it is a dangerous thing for me to keep those kinds of thoughts to myself, where they can spin obsessively around in my head. So I discussed it at length with my therapist. She assured me that this was very normal for a grieving mom, and especially for one grieving two sons in two years. She told me that it was understandable for me to have these thoughts. I told my husband as well. It was a hard thing to do, because I have felt so much shame for having these thoughts, and because I hate for others to see how damaged and broken I think I am, even my own spouse. I debated whether I should share this with him before or after he left for a family vacation with our daughter. I didn’t want to ruin his time away with any fears of me hurting myself, but I also didn’t want him to feel as if I was hiding this. We talked about how hard it was going to be for me with them away. Difficult because I would be missing out on memories with my family, and because it was a reminder of what we had lost. A reminder that I couldn’t join them on vacation because instead of being on my maternity leave and looking forward to the impending birth of our son, I was unable to take any more time away from work since I had just spent three months grieving our son’s death instead. Those reminders are crushing for me, and I feel like I’ve been trapped under their weight for more than two years, since the death of our first son in 2015. That weight is tiring, and the thought of relief from that can be tempting. But that’s not what I want. During our couple’s therapy session, our therapist reiterated how normal these thoughts are, especially in light of all we had endured over the past few months. The past few years. Then she suggested we make a plan. At this point, even after I talked with Amie and researched plans, I still did not have one myself. Nothing concrete any way, just a vague idea of what I would do. That wasn’t enough, and we devised a real one during our session. We agreed that Justin would call me everyday to check in. He promised to not allow me to blow him off with easy platitudes like, “I’m fine,” and I promised to be fully honest with him, and not worry about ruining his vacation. I also made the decision to not drink while I was alone, since that could lead to further depressing thoughts and lowered inhibitions. Our therapist suggested that I make concrete plans with friends, so that I would have limited stretches of time to get lost in my own thoughts. It gave me something to look forward to. I also had friends that I knew would be available at the last minute, if I felt the need to be with someone. Finally, I knew that if I began to have more thoughts of suicide, I could call either my therapist or the Suicide Prevention Lifeline (1-800-273-8255, which is available 24 hours a day), or, if I was really desperate, I could either drive myself or have a friend drive me to the hospital and let them know I was having thoughts of hurting myself and needed help. I can’t sit back on my belief that I will not harm myself, and think that’s enough. I can’t stubbornly deny the possibilities and what ifs. Some people might say that suicide is not an option, but for me, that isn’t true. It is an option. It’s just not one I want to use. I want to continue to get through these moments, because that’s all they really are. Times when I have been stifled by depression or plagued with suicidal thoughts are still just moments in the grand scheme of my life. What I need is to find ways to get through those moments. Something to bridge between the good, or even great moments that are also a part of my life. I have to remain ever vigilant, because my depression is unrelenting. Having a plan is part of that vigilance. It is my bridge and, hopefully, the key that I’m looking for. The answer to my question of why not me. That answer, this week at least, is that in making my own suicide prevention plan, I made a plan to keep on living. Tell others: Instead of letting these frightening thoughts fester inside of me, where I could obsess over them and let them grow, I chose to take away some of their power by speaking with others about these thoughts. Those people included my therapists, husband and brother (who lives with us, and could then be aware while he was home). Keep the lines of communication open: I knew that I would be checking in with my husband each day, which kept me open and aware of my feelings, rather than hiding from them. Make plans: Having concrete plans helped me have something to look forward to during the time that I thought I might struggle most. Instead of isolating, I allowed myself to be distracted by something I don’t often get to do and I enjoyed it immensely. Even during the time I wasn’t with a friend, I made sure to reach out and interact with others via Facebook to occupy my time. Avoid alcohol: Since I don’t use drugs, alcohol was the only concern for me. I don’t drink often, but knew that this would be the best time to abstain altogether for me. Reach out to friends: I made sure ahead of time that I had friends who would be available during the week, even if I didn’t tell them why. I also made a list of people I would be able to reach out to at any time, such as my friends, Vicky and Sara, if I felt I was struggling at any point in the day, as well as Trisha and Kainoa, night owls like me who I could contact in the middle of the night, without guilt, and talk to about how I was feeling. Reach out to my therapist: Since my therapist was aware of how I was feeling, we had talked about me contacting her if I needed to. Reach out to the Suicide Prevention Lifeline: I have often encouraged others to call the lifeline if they needed to, and I knew that I could as well. Get to a hospital: If all else failed, I would do anything to protect myself, including finding others who will protect me from me. Today should have been my son’s first birthday. I should be watching Josiah smash into his cake and taste sugar for the first time. I should be looking forward to other milestones, like his first step and his first big fall. Instead I am reflecting on different milestones, because today, for me, signifies two anniversaries in the aftermath of my son’s death. 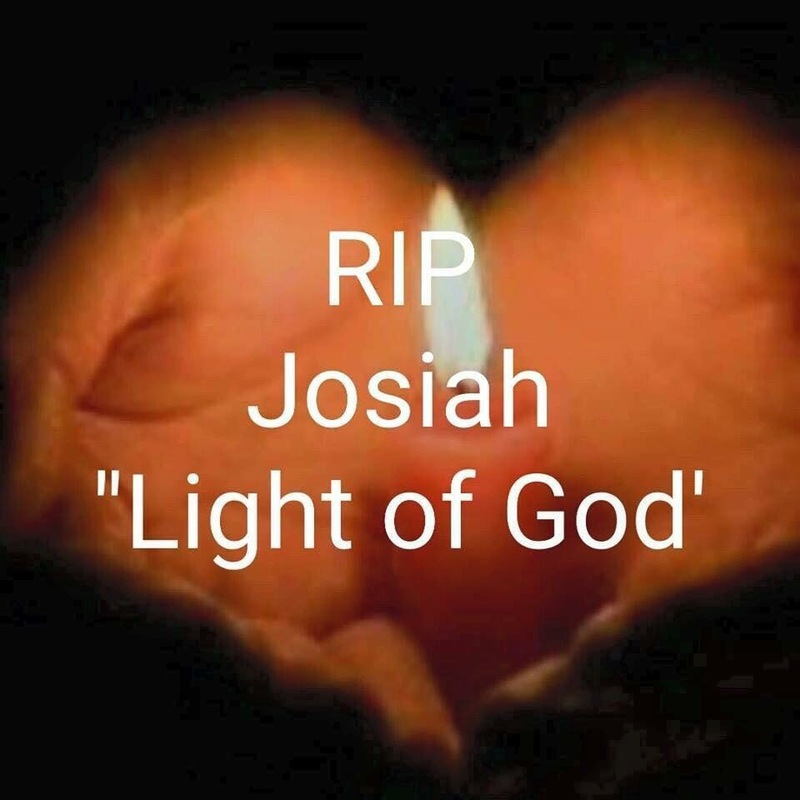 For my husband, the day that Josiah was taken from us is a difficult anniversary. It is for me as well. Yet last year, as his due date of September 15th approached, I felt impending dread for what the emotions of that day would bring. The day we should have seen his sweet face for the first time. The day we should have brought him into our family. To counter the pain I might feel, we planned an evening with family and friends, to commemorate his short life with a small ceremony. We also asked family and friends around the world to think of him and light a candle with us at 8 pm that evening. There was such an amazing outpouring of love and support from everyone that I couldn’t help but be lifted up by the strength they gave me. That makes this is an anniversary of sorts. It’s a day I can’t forget, in both sorrow and love. I can’t call it his birthday, because he never had a chance to be born, really. So I’m calling this his Unbirthday. While that may sound a bit morbid, I can’t help but think of the scene with the Madhatter in Alice In Wonderland, and the Unbirthday Song that is sung. An unbirthday is a celebration of all the other days. I choose to celebrate Josiah today. Unmarred by the memories of our loss, like the anniversary of his death brings us, today is a day I can think about the life that was so very loved. Today also marks the final first anniversary in what has been the hardest 16 months of my life. Since Josiah’s death, I’ve had to face his impending planned due date, as well as the many dates that were moments of our lives with him. The day we found out we were pregnant again after three and a half years of trying. The day of our first sonogram. The first day I felt him move. Each date sliced the wound open a bit more, reminding me of what we had lost. But after each cut occurred, I would find myself continuing to heal. Through talking about our loss, seeking others who understand it because they’ve experienced it themselves, and accepting the love and support of those around me, I was able to keep myself moving forward. I’ve made it to this anniversary with a clearer vision of who I am and the strength I possess. I don’t believe that we ever get over grief, only that we simply learn to live with it inside of us. I don’t know what the future holds, or how this pain may be muted by the passage of time, but I do know that I feel better prepared now. I feel like I can face all of the future anniversaries in a healthy way for both myself and my family. This year+ and this anniversary have taught me that it’s ok to be sad, it’s ok to remember, and most importantly, it’s ok to keep going.